12th District, your polling place is St Phillips & James Church Hall, 2801 N Charles St.
14th District, your polling place is The Greenmount School, 501 W 30th St.
Is it normal that neither polling place is actually in its district? Find your polling place here, and get out to vote tomorrow! Tomorrow is a big day. You could help elect an outsider promising to audit city hall to the city comptroller office. You could surprise the nation by putting a Green Party candidate into a Democratic stronghold. You could support established public servants who have been working hard for citizens for their whole careers. You could land a few blows for the conservative movement so poorly represented in Baltimore. You could vote a straight John-Waters-for-everything write-in ticket. Polls open at 7am and close at 8pm. If you are in Remington and the 12th District, your polling place is St Phillips & James Church Hall, 2801 N Charles St. If you are in Remington and the 14th District, your polling place is The Greenmount School, 501 W 30th St. If this is your first time voting in this location, you may need an ID or a bill, paycheck, or other proof of address. Otherwise, you do not need ID to vote. I kid, but I'm also serious. At the national level, no matter who wins the White House, the popular vote totals will matter because that will tell the rest of the elected officials in DC to what extent the nation is behind the next President. And areas with strong voter turnout get better public services. More on that later. 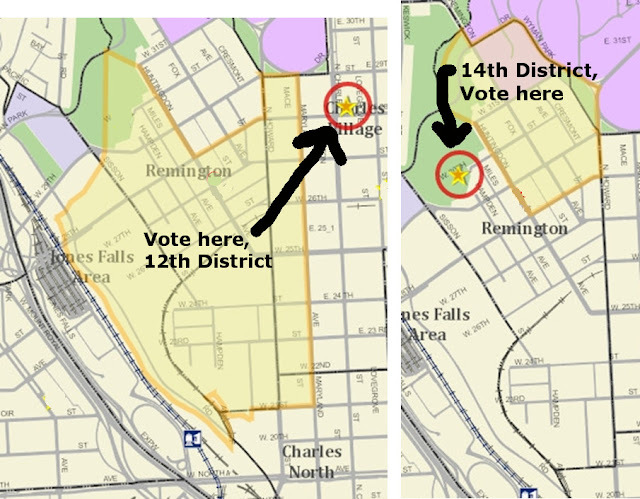 At the local level, most of Remington is in the 12th District and the 12th District is competitive in the City Council. Green Party candidate Ian Schlackman and unaffiliated Democrat Dan Sparaco have a real shot at an upset over Robert Stokes, whose campaign has been anemic, at least in this area. Independent Frank Richardson has been energetically cross-crossing the district as well. But the draw of the Presidential and Senate races may bring enough straight-ticket Democratic voters to the polls to bring him across the finish line. State Sen. Catherine Pugh is favored to win the Mayor's office, but the write-in campaign of former mayor Sheila Dixon throws in a monkey wrench. Will she split the Democratic voters, giving a rare win to the Green Party's charismatic Joshua Harris? Or will she split the anti-Pugh vote with Harris, giving Pugh a wide margin of victory? Or will her effort fizzle entirely? You can, and I think should, vote in favor of Question J, which would create an affordable housing trust fund. This ballot measure would be a real step forward in controlling the rising rents in Baltimore, Remington included, that has so many feeling like they're losing their neighborhood. Several other ballot questions really could go either way. Many of the other personnel elections that Remingtonians will weigh in on are not really competitive. But just like at the national level, the margin of victory can strengthen the hand of a clear winner or get the sharks circling around a politician who just squeaks by. The Remington Community Newsletter does not have an editorial board, so other than the above endorsement for Question J, we're not endorsing this year. But no matter who you support, please do get out and vote, because areas with high voter turnout get more attention from WHOEVER wins. This is especially true for city-level elected offices. Even the most ethical politicians need to get elected and reelected, and they will spend more time on areas where more votes are winnable. Imagine you were a city council person, and there was a neighborhood that needed schools and roads and zoning support like any other, but year after year they didn't show up and vote. Would you prioritize fighting for them or spend your limited energy on another community where the people you help are actually going to decide if you get to keep your job? So find your polling place, and go vote tomorrow. Your vote really does make a difference. If you need help, come to the Parish House at Guardian Angel (2629 Huntingdon ave) during the workday. Or text/call me at 443 650-8733.